The Brighton and Hove Dementia Action Alliance is hosting a free open launch event to invite people to look at what is already happening in the city and what we can do to make Brighton and Hove a truly dementia friendly city. The Mayor will open the event which will include a line-up of truly inspirational speakers, short films on dementia awareness, a market stall of different local organisations supporting people living with dementia and a free lunch. People with dementia say they want to continue to live and take part in their community. 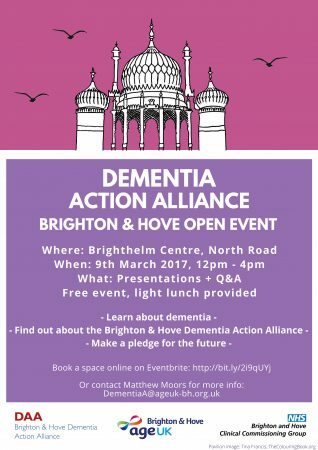 There are over 3000 people living with dementia across Brighton and Hove and this figure is projected to increase to nearly 4000 by 2030. There are also over 2,300 unpaid carers, often with their own health concerns, of people living with dementia. The Dementia Action Alliance want businesses, organisations and community groups across the city to join the Dementia Action Alliance and pledge to become dementia friendly, so people with dementia, their carers and families can have better access and support, and be more fully integrated in their communities.